When heat pumps start failing and not working, very often is the fault of the heat pump compressor, as the main component. Troubleshooting a compressor, however, may be more complicated than you think. The heat pump compressor is a critical part of heat pumps. Without a compressor, the device wouldn’t be able to do its cooling or heating and work. That’s why, when the compressor starts failing; you will undoubtedly experience a wide array of problems that may be hard to fix. Before we start, let’s see first what is the heat pump. The heat pump is the device that uses heat from air or water for space heating and domestic water production, making the process ultra-efficient and environment-friendly. More about heat pumps, and how they work here. What is a compressor exactly? A heat pump compressor is very similar to an AC compressor. Actually, many technicians affirm that you can use an AC system compressor on a heat pump or vice-versa without any problem. However, heat pumps and air conditioners have different thermal loads, and varying working conditions. Nowadays, most heat pumps use a scroll compressor, yet you can also find flow compressors and even rotary compressors which are louder than others, while AC systems use a reciprocating compressor more commonly. Whatever the type is, the primary purpose will always be to help the heat pump or air conditioner to cool down and maintain proper temperature while working. The heat pump compressor, however, has two main purposes: to maintain the refrigerant flowing inside the heat pump and to increase the pressure in which the refrigerant is compressed into gas. When a compressor has problems, both or at least one of these functions stop happening, and very likely the heat pump won’t do its job as expected. Also called positive displacement compressors, these compressors work by suctioning, discharging and then extruding the water vapor or refrigerant. These are one of the most effective and fastest when working, and they can vary in the number of valves, number of cylinders and amount of compression stages. Rotary compressors are the smaller of the bunch, which use a rotating piston to compress the refrigerant. This also helps to reduce the noise other compressors make and minimizes the process of compression in just suctioning and pressuring the coolant. These compressors, in contrast with the rest, use a center coil called scroll, which alongside another coil that rotates around can produce the compression necessary for the refrigerant to flow in the heat pump. These are newer compressors, yet they are thought to be more durable, more resistant, less vibrating, smaller than others, and much easier to fix when needed. Very similar to rotary compressors, this type of compressor consists of suctioning, transporting, and extruding the refrigerant. These compressors, in contrast, use two helical rotors to move air from one side of the heat pump to the other, while doing the compressing process. These features make the screw compressors much more reliable and often much more efficient than others, yet they are mostly used in heat pumps with large outputs, meaning that they work better for large operations instead of small ones. Centrifugal compressors use centrifugal force to compress the refrigerant, as its name says. It simply captures the refrigerant gas and spins it so fast that it gets compressed without much vibration and much more efficiently. However, only large and extra-large heat pumps use centrifugal compressors, as they also help to reduce gearings and promote better & easier lubrication when working. If you have been searching to buy a heat pump you have probably heard about single-stage, dual-stage, and variable speed compressors. Now the question is which one to buy? A single stage compressor uses only one speed. If you have an old AC or heat pumps, the odds are that it is a single-stage model. They are cheaper and less efficient than other types. When they operate, they use all of its 100% capacity, no matter is it needed or not, is the weather hot or mild. Even if it has to work for a short time. This means, they tend to turn on and off more often, which will put more stress on the system and increase the energy consumption. These do not dehumidify homes very well. A two-stage compressor, as opposed to the above one-speed type, has two speeds, high and low, one recommended for high loads (high temperatures) and low speed for milder weather. Two-stage compressors do not run as often as variable speed type but do cycle on/off less often than single stage type. A variable speed heat pump is modulating its power, the capacity can increase or decrease in small increments, adjusting its power relative to the load and how much of cooling is needed, for example. This type is also known as the inverter-driven compressor. The greatest benefit is that it operates only what it is needed, thereby saving energy, money, while reducing the wear and tear. As opposed to short cycles on a single-stage type, variable speed compressor can run longer, sometimes all or most of the day, when it is very hot outside. As a result, the home comfort level is increased, there are no cold air blasts and the thermostat doesn’t have to be set too low. Troubleshooting problems with a heat pump compressor seem too hard for a non-experienced user to do. However, it is actually easier than you think. The first thing you need to do if you think your heat pump is failing is to go near the compressor and check out if it makes any weird sounds. Weird noises of clacking, hard vibrations, and constant tickling are signs of a compressor that is going bad. When the compressor is not working anymore, very likely it will make these same sounds and noises, but with an additional backspin sound which means that the valves are not working. Or instead, it could just not make any sound. Not as common as burned out compressors, yet the device may start working inefficiently, causing the whole process of compressing harder for the heat pump and eventually make it work in a wrong way. This often causes a lot of sounds as well. Make sure the evaporator is absorbing enough heat. With little heat, compressors fail to compress the refrigerant which stays on the compressor, causing irreparable damage without burning it out. Check the capacitors to make sure they are working correctly. Defective capacitors are often the reason why the compressors don’t work. This could be caused by voltage problems, including shorting and lightning strikes. Avoid the head having too much pressure. A dirty condenser coil, a fan motor to recirculate air back to the coils and induce improper rotation, non-condensable liquids in the compressor or overcharge may eventually cause the compressor to work with too much pressure. Check fans. Often, the fans are the reason the compressor is not working correctly. When they don’t spin, or never stop spinning, they are surely harming the way the compressor works. Take care of voltage. Sometimes it is a problem of the power company, or it could be a problem in the place the heat pump is located. When there are corroded wires, lose or improper connections, high and low voltage/amperage are normal, and they can cause compressors to work defectively. Check for failed superheat metering. When there is a low or high charge of refrigerant due to a bad metering device, the compressor will undoubtedly start working defectively. This could be due to clogged lines, too much moisture, or twisted and broken lines. Reduce internal overloads. Defective compressor valves often cause overloads inside the heat pumps. This is not as common but could cause irreparable damage to the component. Maybe the most expensive and costly problem you could experience with a heat pump compressor. There is a vast list of reasons why a compressor burns out, but the most common is always by overheating. And this mainly happens due to wrong or lack of maintenance. Do proper maintenance. Clean the condenser coils and make sure no tube or pathway is clogged or filled with dirt. Check refrigerant lines in search of restrictions. Avoid clogged copper lines, leaking lines, twisted or broken lines, or simple restricted flow in the refrigerant pathways. Make sure all metering devices are functioning correctly. Restricted metering devices, malfunctioning TXV (thermostatic expansion valves), too much moisture or dirt and debris can cause restricted metering. Eliminate moisture as much as you can. Whether it is in the compressor or any other part of the heat pump, moisture in the system causes burnouts as well. Check everything from the oil to the filters in search of too much moisture. Avoid oil-refrigerant loss or leaks. Finding refrigerant leaks on the compressor or lines means that the compressor is working harder than expected. Oil refrigerant is necessary for lubrication and temperature control, so without the proper level of oil, the compressor may overwork. Don’t short your compressor. Avoid turning the heat pump on and off repeatedly, as it could cause the compressor to receive too many AMPs in a short period, shorting it out and possibly burning it completely. This also affects metering devices. Avoid contaminating the compressor. When doing maintenance, make sure you or the expert don’t contaminate the refrigerant or the tank with acid or any other liquid. This tends to cause many problems, including burn out. *All these problems and recommendations can be followed or improved by making sure the device is installed correctly. For burnouts, replacing is the only solution to fix the compressor. The first thing you need to know before deciding whether to replace the compressor or not is to make sure that the replacement is the only way. And the only way to do that is by contracting an expert to inspect your device. Replacing compressors may end up costing even more than buying a new heat pump. A new heat pump compressor should be at least 50% more efficient than the defective or burn out compressor. Heat pumps which are newer than five years old are easier & more comprehensible to change the compressor to than older heat pumps. If the heat pump is older than five years old, very likely you will have to change the whole device entirely. Mainly due to efficiency standards. With these points into consideration, you will very likely find your best option. According to EPA regulations no one without the expertise or certification should handle the refrigerants. Including those that affect a heat pump compressor. Sometimes, it is the refrigerant which is defective or contaminated, so very likely you will have to change it entirely as well. Make sure everything from the new compressor fits with your heat pump. From the refrigerant to the valves, tubes, and liquid lines. Copper refrigerant lines should be put away when replacing the compressor. An improperly installed compressor is often the cause of many compressor problems and burnouts. Ask for help if you can’t install it correctly. Caution & patience are essential for changing compressors. As critical parts of heat pumps, without the proper handling and installation methods, you may end up breaking the heat pump by replacing the compressor. Need help with your heat pump compressor? 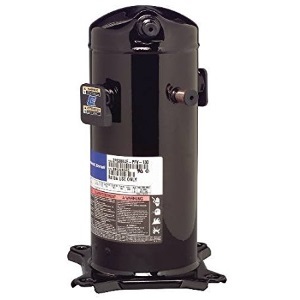 As you should already know, the heat pump compressor is a complex component that is essential for a heat pump, very expensive as a spare part and replace and hard to fix. From installation to replacement up to troubleshooting common problems, you may have hundreds of things to consider – but with the help of this troubleshooting guide and provided tips, it should be easier to repair.